The eye that holds you in its thrall. Then they start the trip at last. Another city? Far to go. Before the ice could close in and crush the hapless trio, Doonar suddenly leaps into the air and flicks his tail, sending Richard and his friends sailing onto safer ice cliffs nearby. Doonar then quickly swims between the cracks and dives under the ice to swim away to the safety of the open ocean. With everyone safe, the three pick themselves up, consult the Path Finder for direction, and head towards a series of distant cliffs. The trek there is long and hard, and despite Shunta's protective oil they are chilled to the bone. They are exhausted by the time they reach the cliffs. They scale the heights to get to a plateau up on top, and there they arrive at Frigoria, a city of ice and snow. 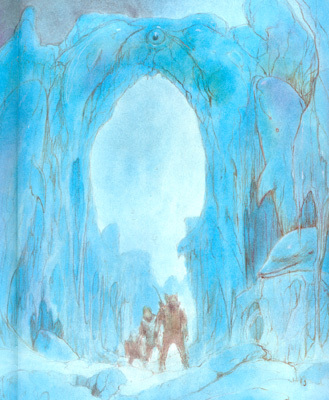 They approach a monstrous arch cut into the walls of ice, and as they pass underneath it, the trio notice figures encased inside the ice of the archway. The figures are recognized as dolphins, their faces frozen in horror. Quietly, the three pass under the arch and enter the icy city. The cold is increasingly painful, and as Richard suggests they stop for a rest, Melek suddenly collapses onto the ground. Richard grabs his friend and tries to haul him back to his feet when a large shadow looms over the friends. Richard looks up to see a giant one-eyed man towering over them. 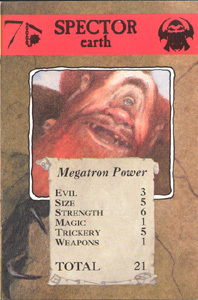 The giant welcomes them to Frigoria before scooping them up in his powerful arms. With no power left to resist, the trio collapse into unconsciousness. 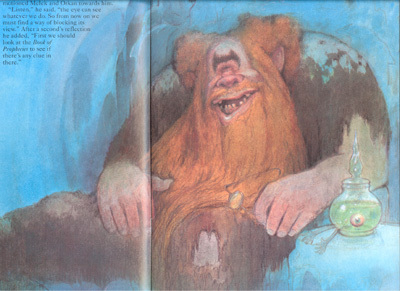 Richard later awakens to find himself inside an immense chamber, where the giant is sitting across the room on a large throne, staring straight at him. Richard then realizes he is no longer cold and notices he is draped in fur blankets. He sees his friends beside him, awaken and also clothed in blankets. Richard asks the giant man who he is; the giant introduces himself as Spector and says he will soon take Richard to the Evil One. Spector then reaches for his face with his hand, and a squelching sound is heard as the giant removes his eye from it socket. 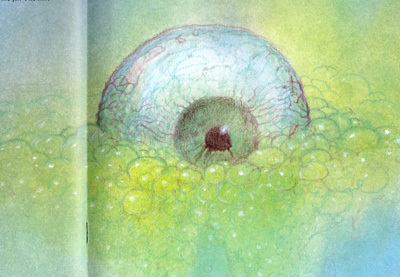 The giant then drops the eye inside a jar containing a green liquid, and Spector warns the trio that even while he sleeps, he will still be able to watch them. Moments later, the giant is sound asleep, snoring. Richard and his friends stare at the eye, which seems to follow their every move. As an experiment, Richard attempts to walk towards it; Spector's hand instantly twitches towards the jar. When Richard moves back, so does the hand. Confirming that the eye can see them, Richard talks to his friends about it and they decide to read the Book of Prophecies first, turning their backs to hide the text from the eye. 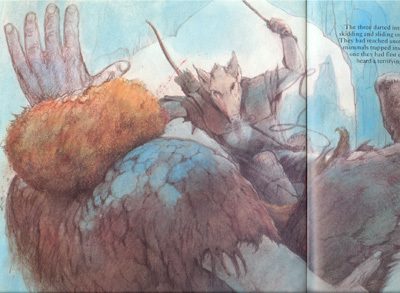 After reading the verse, Richard has an idea and asks Orkan and Melek to turn their backs to the eye and hide Richard from its view. When the two friends do this, Richard lifts the hood of Golan's tunic over his head and becomes invisible. He then stands up and walks towards the eye's jar. Luckily, the eye doesn't notice anything amiss and Spector remains still. Upon reaching the eye without difficulty, Richard reaches out and picks up the container. But hies grip slips and he drops the jar, sending its contents slipping onto the floor. The green ooze melts the ice on the floor while the eye rolls away and begins shriveling without its protective liquid. Spector reacts by squirming in agony, feeling pain in his empty socket. Richard removes the hood and calls for his friends to make a break for it. They head towards the only exit they can see, with Spector lumbering in pursuit. 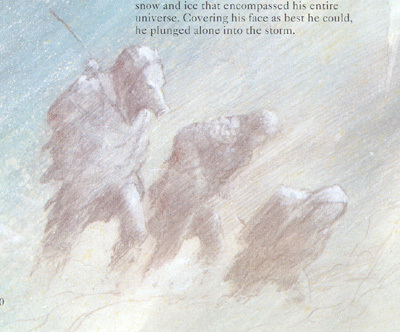 The trio emerge into a giant room of unpolished ice, reflecting their images all over. Within moments they find themselves lost inside the giant hall of ice mirrors, and it doesn't take long for Spector to crash into the room as well. With the maze-like room destroying their sense of direction, Richard orders his friends to get behind him. Richard then shuffles his way forward, until his hand touches burning ice forming a wall. With a wall found, Richard starts moving along the wall until his hand finds empty space. Stepping inside the hole, he discovers a corridor and starts running, his friends in tow. They suddenly emerge onto a dark street, escaping Spector's ice palace. But the giant is still chasing them, and the three race down the streets of Frigoria, eventually reaching another arch with sea mammals encased inside. Orkan gets an idea and asks Melek for his rope. With the rope in hand, Orkan climbs up the arch to its peak. With one end tied around the edge of a battlement on the city wall, and the other end around his waist, Orkan draws his sword and waits for Spector to arrive. 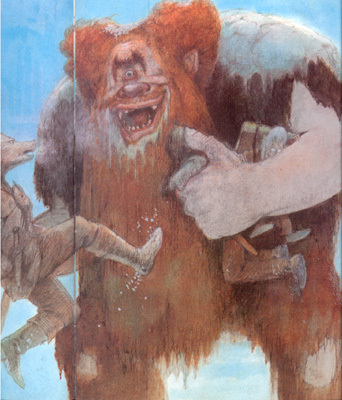 The blind giant, guided by the sounds of the escaping trio's voices, quickly arrives at the arch and begins pounding it frantically before stooping underneath it. Orkan seizes the opportunity and launches himself off the arch, the rope pulling him into arc down towards Spector. Swinging his sword, Orkan thrusts the blade directly into the giant's soft spot: his empty eyeless socket. Spector topples to the ground, dead. Melek suddenly points towards Frigoria, and the trio witness Frigoria beginning to melt upon the death of Spector. The icy buildings of the city are the first to go, and soon the arches encasing the sea mammals melt, freeing the trapped creatures inside. Soon the entire lake upon which Frigoria was built has melted, leaving only the floating carcass of Spector in its wake. The sea mammals splash around in the melted waters happily before heading out to sea. With renewed vigor, Richard checks the Path Finder and the three head out into the indicated direction. At first the going is easy, with the sun shining in the sky and the snow easy to trek across. Eventually, however, a blizzard strikes them from behind and covers the icy lands in darkness, plunging them into a cold storm with zero visibility. Richard calls out to his friends to remain close to him, but he discovers they were already lost from sight and sound. Feeling alone, Richard presses forward as best he can. The Sea Mammals are a race of creatures that dwell within the waters of the Ancestral World. They are similar to the Water Forces in that they are aquatic animals, but they differ in that they breathe air instead of water. 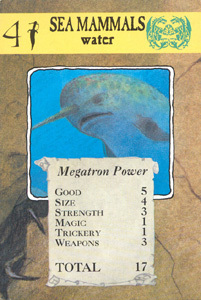 It is suspected that Tishon and Shunta are the Guardians of the Sea Mammals, though this may not be the case, since the Twin Guardians are fish-like themselves. 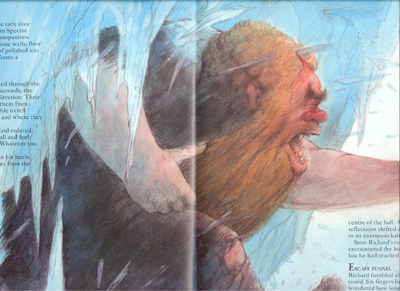 The Sea Mammals were imprisoned in ice by the Evil One and guarded by the giant Spector, until Richard killed the giant and released the spell that encased them in the ice. "Above them loomed a giant. He was thickly bearded, and clad in rough woolen clothes to insulate him against the cold. In the middle of his forehead sat a single, blue-gray eye that stared expressionlessly at Richard...He advanced towards the shivering trio, then scooped them up into his massive arms." 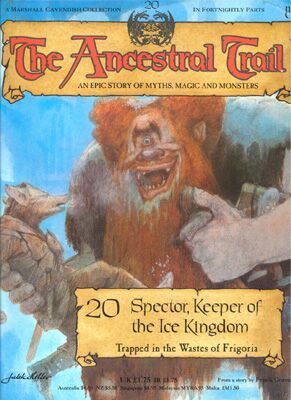 With the twentieth issue of The Ancestral Trail, the trio come across another minion of the Evil One whose priority is to guard something entrusted to him by his master. 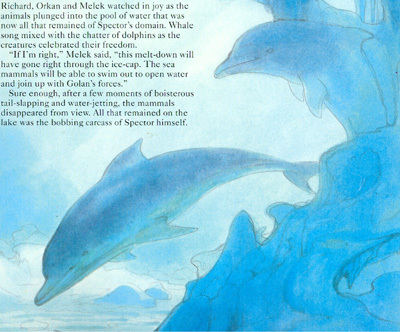 In this case, Spector was asked to guard the incapacitated Sea Mammals, similar to how Mirra guarded the stone statues of Juroot and his Bird Forces. Like Mirra, Spector has no need to hypnotize the Sea Mammals to do his bidding, like how Nemis controlled the Water Forces, Gator controlled the gators of the Reptile Forces, and Enlil controlled the Common Beasts. This far into the adventure, one begins to wonder something: if the minions of the Evil One are this easy to dispose of or avoid, why did the Ancestral Forces lose the final battle in the first place? Speculating, it could be that the Evil One had all of his forces amassed at the Ancestral City, allowing him to focus his strength all at once. After winning the battle, the Evil One spread his forces across the Ancestral World, thereby weakening them and allowing a small band to come by and pick his minions off one by one. 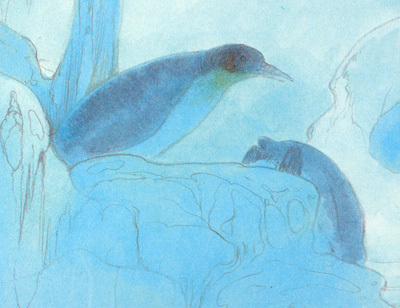 Now, it is reasonable to assume that penguins were frozen along with the Sea Mammals, but it's a bit more humorous to think this was the result of a miscommunication between the writers and artists of the series. Finally, a mistake was made in the writing. On page 306, the writers state that the oil given to Richard to fend off the coldness of Frigoria was given to him by Doonar. The oil was really given to him by the Guardian Shunta. "I am Spector, Keeper of the Ice Kingdom. This is my palace. Enjoy it before I take you to the Evil One. Don't try and escape and don't think that because I'm asleep, my eye can't see you." "If I'm right, this melt-down will have gone right through the ice-cap. The sea mammals will be able to swim out to open water and join up with Golan's forces."